Callan Marine offers comprehensive dredging solutions for any project. Callan Marine has dredged thousands of miles of waterway in the Gulf Coast region to keep our customers productive. We appreciate our natural resources and work with customers to restore the natural beauty and function to coastal areas. We construct and maintain levees for the important task of protecting the lives and property of those who call the Gulf Coast home. The FEMA funded emergency dredging of the West Fork of the San Jacinto River near Kingwood, Texas, is nearing its completion. USACE Galveston District has just released the latest project update, saying that as of April 11, 652 tons of woody debris and 1,547,000 cubic yards of sand has been dredged from the river. The project, undertaken by Great Lakes Dredge & Dock Company, began on September 20, 2018, and is expected to be completed by the end of May 2019. By the completion date, it is estimated that 720 tons of woody debris and 1,684,000 cubic yards of sand will be removed from this 2 mile stretch of the San Jacinto River. Callan Marine was recognized by Dredging Contractors of America for our upcoming dredge, the General MacArthur. The General MacArthur is a massive 32-inch suction cutter dredge currently under construction at C&C Shipyard in Belle Chase, Louisiana. View full story online - click here. Callan Marine announced today the receipt of a $6.375 MM award on the Gulf Intracoastal Waterway (GIWW). The project, administered by the US Army Corps of Engineers Galveston District, will engage Callan Marine to dredge along the GIWW from Freeport to Upper Matagorda Bay, Texas and Channel to Palacios, Texas, and San Bernard River Channel, Texas, and Colorado River Channel, Texas in Brazoria, Matagorda, and Calhoun Counties, Texas. The project is significant to the GIWW in keeping the important maritime highway safe for ship traffic. The project will be completed by the General Patton, one of Callan Marine’s cutter suction dredges. 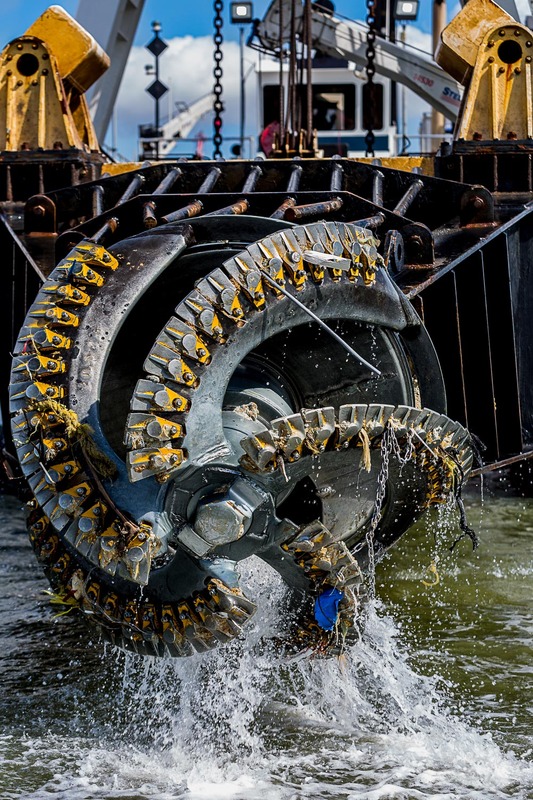 The U.S Army Corps of Engineers’ contractors launched a 27 ton dredger last Thursday into the San Jacinto River as preparations continue for emergency dredging and debris removal along the West Fork of the river. Two dredgers, measuring 90 feet long, 25 feet wide, were transported in and are being reassembled with dredging set to start September 6, 2018. “Recreational boaters should exercise extreme caution along the river from Highway 59/69 to West Lake Houston Parkway and areas of Lake Houston,” USACE said in their latest release. The $69.8 million emergency project, located near Kingwood, Texas, involves dredging and debris removal of 1.8 million cubic yards of sediment that has contributed to recent flooding in the area. This emergency cleanup program was awarded to Great Lakes Dredge & Dock Company (GLDD) on July 6, 2018 and covers about two miles of the West Fork of the San Jacinto River. See the full article online. Callan Marine creates innovative marine construction solutions - like these artificial reefs, deployed off the Texas coastline, helping to sustain and protect aquatic wildlife for generations to come. Callan Marine is partnered with Great Lakes Dredging to restore a 2 mile-long stretch of the San Jacinto River to its pre-Harvey state. These aerial images were taken recently to show progress made on the project. U.S. Capabilities and the road ahead. firms; Callan Marine, Cashman Dredging, and Weeks Marine. OAK BROOK, Ill., July 12, 2018 (GLOBE NEWSWIRE) -- Great Lakes Dredge & Dock Corporation ("Great Lakes") (GLDD), the largest provider of dredging services in the United States and a major provider of environmental and infrastructure services announced today the receipt of a $69.8 million award on the San Jacinto River in Houston, Texas. Read the full release in our News & Media section. Callan Marine is able to customize a wide array of cost-effective, turnkey services for our clients in both the public and private sectors. With every project, we strive to go above and beyond our customers’ expectations — no matter how complex or challenging the assignment.